Happy Monday, friends! Today I'm joining the lovely ladies at The Blended Blog for TBB Asks! Let's jump right in! One // Resolutions or No Resolutions? I don't make resolutions, but I do make lists of things I'd love to do, learn, and enjoy, as well as places I'd like to explore and adventures I'd like to plan in the year to come! I make wish lists for the year as a whole, and for each individual season. Basically, as a lover of lists I delight in filling a lovely new notebook with daydreams of what I'd like to plan in the fresh new year ahead! Two // Love snow or No snow? Love it! Right now the roads and walkways here are clear, yet yards and rooftops are frosted with winter white and in this moment it's absolute perfection! Often when we're months past Christmas I'm over it and eager for sunshine and flowers, but for right now I'm still happily singing, "Let it snow! Let it snow! Let it snow!" This fall we are forgoing flights and road tripping all the way to Walt Disney World! Along the way we will be hitting seven states that I've never stepped foot in! Some of the new-to-us experiences on our itinerary are the Creation Museum, the Ark Encounter, Great Smoky Mountain National Park, and Hilton Head Island! Enjoying a vacation of exploration both on the way to and from our magical "home away from home" is sure to be memorable! Four // Would you rather have a new hair cut or color? Color! Over the years I've had so much fun bouncing around from my natural brunette to red, blonde, burgundy, and many shades in between! It's always nice to change things up (& cover the gray up)! Five // Name one special thing you want to do for yourself this year? There are a few things I've always wanted to learn and skills I've wanted to improve upon (especially photography) that I simply haven't committed much time to. This year I plan to change that! First up, learning how to cross stitch via the kit I ordered this weekend. Six // Least favorite thing about January? Lame, but honest answer, my war on dry skin! Seven // Most favorite thing about January? The coziness! There are things I love about each season. In the winter, January in particular after all the busyness of the holiday season, I thoroughly enjoy the calm and comfort of staying in. I spend most of the month in the softest, comfiest clothes I own, often topped with my favorite blanket. Baby it's cold outside, but here inside it is oh so cozy! Eight // When do you take down your holiday decorations? I take everything down after New Years day. My entire life I've celebrated the Christmas season through New Years. Honestly, the week between Christmas and New Year's Day is when I feel the most full-out festive! My family has the time off from school and work then and we binge watch Christmas movies, indulge in far too many goodies, and I soak up the season like it's my full-time job! This year I'm leaving our decor up through next weekend as we are hosting a belated Christmas party and what's a party without the appropriately festive atmosphere? Nine // Do you diet in January? Once all our Christmas and New Year celebrating has concluded I do begin to eat better (read: I start eating foods other than cheese and chocolate ;)) and resume tracking my calories on my "Lose It" app. Ten // What area of your home do you want to organize the most? As I read this question I long to happily cheer, "DONE!" I haven't talked about this since returning from my blogging hiatus, but I'm excited to share with you all today that over the summer I was able to achieve a long time goal! Each and every year of my entire adult life I have I talked about, journaled extensively on, and aimed to get rid of everything we didn't need, use, or love. 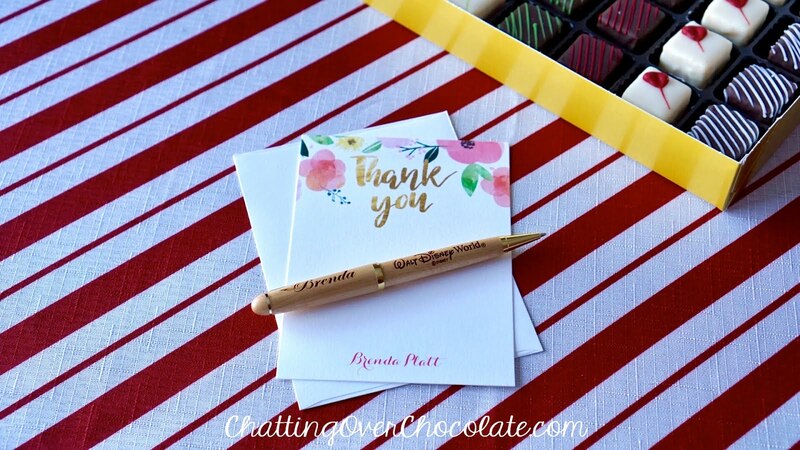 Exhibit A: My New Year Blog Post 2014! Yet, my sentimentality always got in the way of my ability to do the type of overhaul in my home that I truly desired. I was also guilty of safeguarding several items in previous purges under the protection of those three words, "just in case". That all ended last summer! 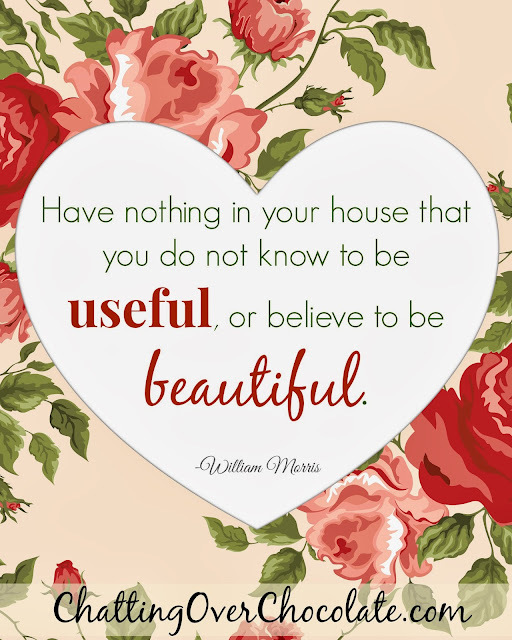 I devoted nearly every free minute of each day for about 6 weeks to decluttering and simplifying my life and home! We rented a large dumpster and filled it. We borrowed my parents' truck and hauled away over half a dozen heaping loads to be donated to charity. At long last, my closets went from bursting at the seams to holding only what we actually use, wear, and love! Now instead of having to take a handful of random items out of my kitchen cupboards to get to something I actually use, I can easily access anything I need. I went from dreading having to find something when asked where it could be at the last minute to knowing every single item we own and exactly where it is located. There is finally a place for everything and everything is in its place! I could honestly do an entire blogging series on this, but I'll simply sum it all up in saying that we parted with well over half of our belongings and my home is now organized to my liking. It has been an incredibly freeing journey! The end result of my efforts and shift in my mindset assure me that I will never again return to the chaos of needless clutter! Baked Potato Soup with the works! 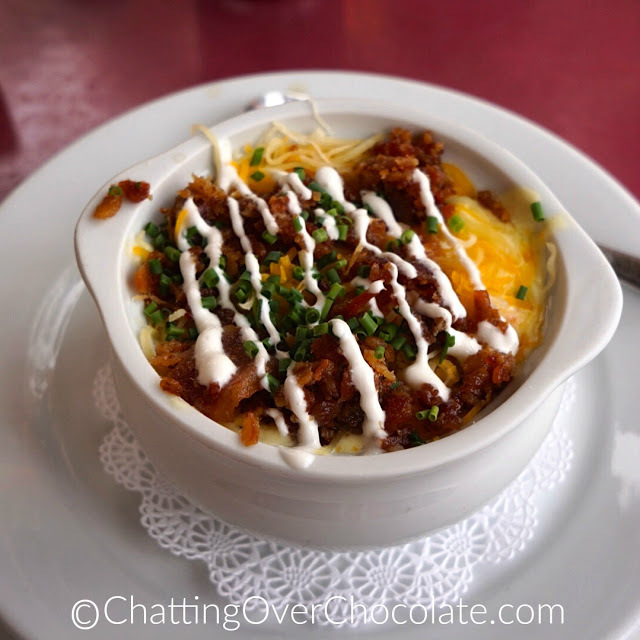 I still daydream about the spoonfuls of comfort in this bowl I enjoyed at the Carnation Cafe at Disneyland! Mmm! This time of year I'd say a quiet evening lounging in my comfiest pjs while watching a Hallmark Movies & Mysteries flick (preferably one from the Aurora Teagarden or Garage Sale Mystery series) with a delicious snack and a yummy drink! Thanks so much for stopping by today! I'd love to hear how you'd answer any of the above questions in the comments section below! 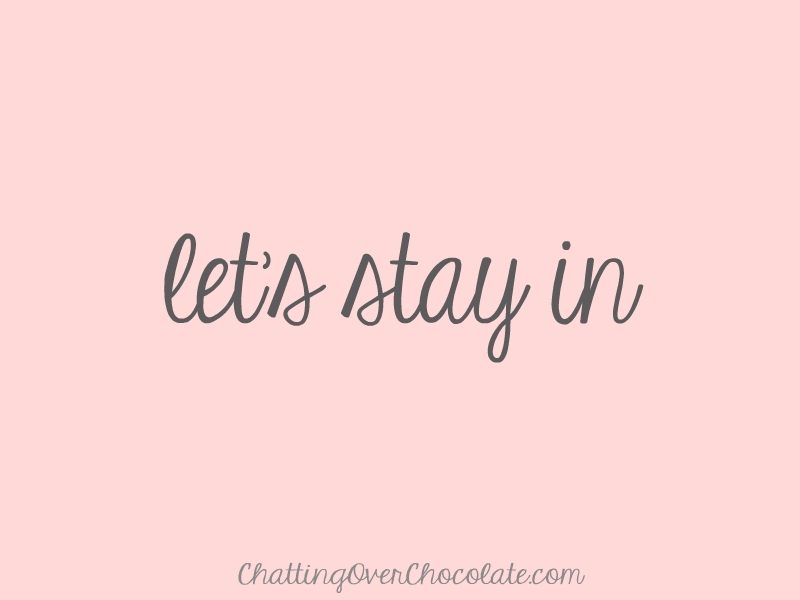 If you are visiting from the TBB link up please be sure so say, "Hello" as I'd love to check out your post as well! That baked potato soup looks positively yummy! Have a great week! There are LOTS of fun things I could comment on from this post...but I'll stick to 2. :) #1, bravo on your home decluttering and organization success! I did that right before I started blogging and I've enjoyed the benefits ever since! I'm not really a soup fan and have never had baked potato soup but it looks so good!! I think I need to try it. I would love to see the Ark Encounter too. It's in my very own state and I have yet to see it. Have a wonderful day! i hear ya on the dry skin!! When I start itching I know it's gotten too cold! I'm totally jealous you are DONE with purging, etc. I'm so working on cleaning out and have gotten 3 bedrooms done but only half my kitchen thus far. And I still haven't hauled everything away. Hoping 2018 is the year we get it all done as I'm so ready to just live in my home! 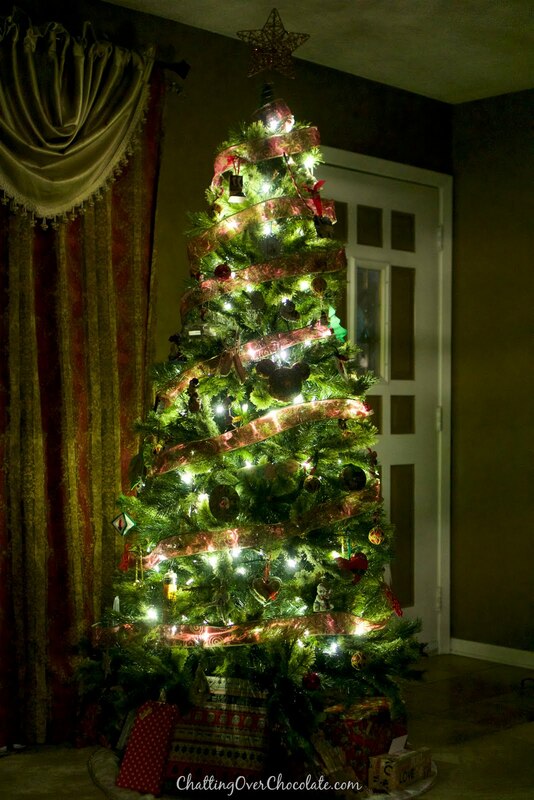 I just can't wait to see that beautifully decorated tree in just a handful of days! Love you bunches, sweetest friend!! yes to coziness!!! it's my fave!! baked potato soup is AMAZING!! Haha! 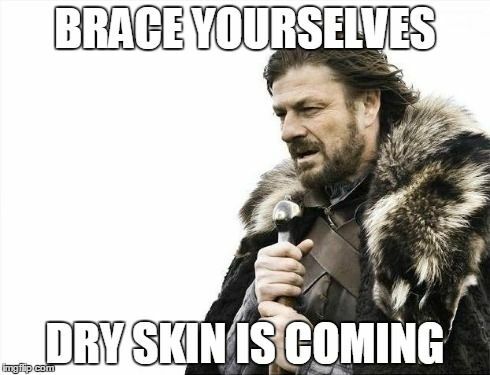 I saw that dry skin meme and laughed because my post is all about the dry skin today. So funny. Road trip to Disney!!! That sounds like a blast! Wow - you're my hero! We've rented a dumpster a couple times and filled it, yet my house doesn't seem any emptier. I need to get rid of the husband (Mr. Packrat) for a while and have a declutter party. Your tree is beautiful! I never thought I'd like plain white lights, but yours I do! I like to use Sparkpeople for calorie counting (which I only do when I feel my clothes are getting a little tight, which always happens after Christmas) and I've never heard of LoseIt. Oh gosh, I have an entire cheese drawer in my fridge. I LOVE cheese. LOL. Will have to check it out. 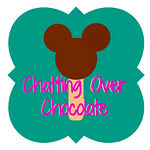 We are actually thinking of staying at the Disney resort on Hilton Head this summer, I'd love to hear what you think of Hilton Head when you drive through/visit it!